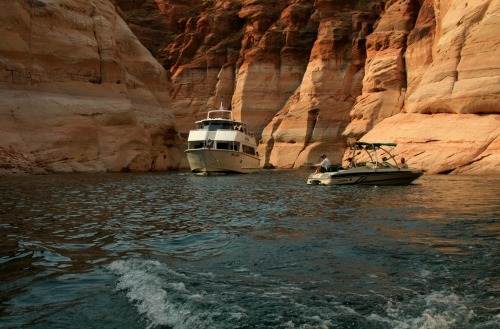 Lake Powell water activities are sometimes overshadowed by the fact that Lake Powell has become the Houseboating capitol of the world. 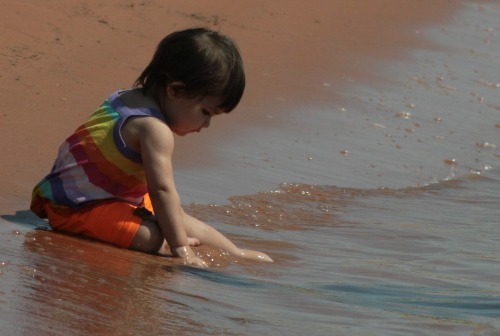 However, if it can be done on or in the water, there is a good chance you will find it at Lake Powell. With an average water temperature of 75° F in the summer months and 264 days of sunshine during the year, it is no wonder Lake Powell receives over three million visitors a year. Interestingly, the average length of stay of 4.5 days is the longest stay of any federal park. It’s easy to be distracted by the beauty of the surrounding country, but many come here simply to enjoy the many Lake Powell water activities, and on this page I will try to give you an introduction to some of them. Summer and swimming just seem to go together. 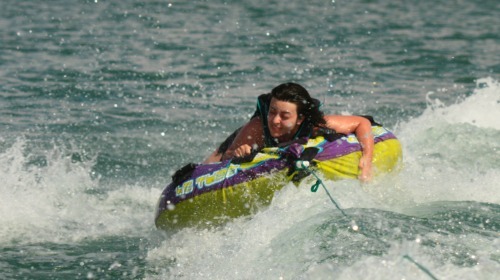 It is one of the Lake Powell water activities that you can do just about any place on the lake. However, some, like the Lone Rock Beach about 4 miles NW of Walweap Marina, are more popular than others. On the northeast end of the lake, areas around Bullfrog Marina, like Hobie Cat beach and the Stanton Creek Primitive Campground, are popular swimming spots. There are no life guards at Lake Powell. Swimmers do so at their own risk. 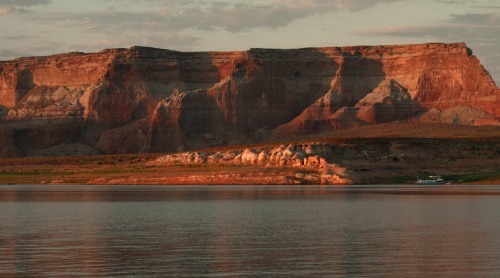 With over 15 different species of fish, from Channel Catfish to Crappie, from Bass to Northern Pike, it is no wonder that fishing is one of the morepopular Lake Powell water activities. The Bass fishing attracts anglers from all over the country many of them trying to best Sam LaManna’s Utah State record Largemouth Bass of 10 pounds 2 ounces or Travis Jenson’s Lake Powell record Striped Bass of 48 pounds 11 ounces. On the Colorado River, below the Glen Canyon Dam, the water temperature remains at a constant 46-47 degrees Fahrenheit, perfect for trout. 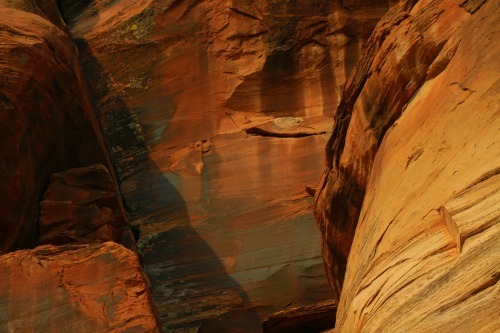 It has 96 named side canyons that bend and twist serpentine-like through ancient stone. The only way to experience the beauty and wonder of Lake Powell is by boat and it matters not if the boat is a kayak, a canoe, a powerboat, a houseboat or a tour boat. I am sure that someone could make a case that SUP is really just a sub-heading of boating. However, since it is a relatively new Lake Powell water activity, with its own following and sub-culture, I have chosen to list it separately. 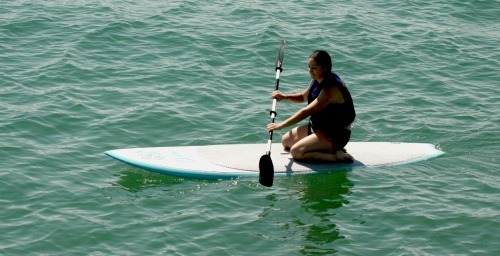 SUP is fun, easy to learn, doesn’t require a lot of equipment, develops core muscles and balance, and it delivers a complete body and cardiovascular workout. It's the perfect training activity for surfers, skiers and paddlers. It is even a good platform for fishing. When you’re tired of paddling standing up, you can kneel or sit down and paddle. This is a great Lake Powell water activity, especially with children who do not water ski. Having said that, however, there are a lot of teens and adults who love the thrill of speeding across the waves, the spray in their faces, their bodies just inches above the water. When I first learned to waterski, back when both Lake Powell and I were considerably younger, you either skied on two regular skis or a slalom ski which was just one ski. While both of these are still being used at Lake Powell, they are gradually being replaced with wakeboards, at least with the younger set. 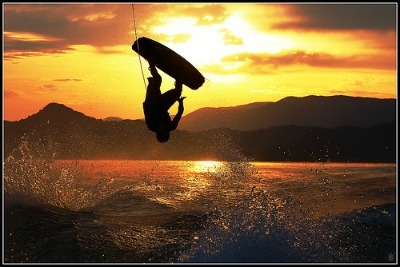 Wakeboarding is to water as snowboarding is to snow. Both of these have, seemingly, replaced conventional skis. At Antelope Point Marina, one doesn’t even need a boat to create the wave or pull the boarder. They now have a cable park which has been upgraded to a two tower cable system. It seems to me that activities on the snow and on the water have followed similar paths. Both have slalom skiing, albeit snow skiers use two skis. The skis of both sports have evolved into a specially designed board with special boots/bindings; snowboarders have “half-pipes” and wakeboarders have cable parks with rails and jumps; both have para-skiers and both sports have motor-propelled machines (snowmobiles and jet skis). 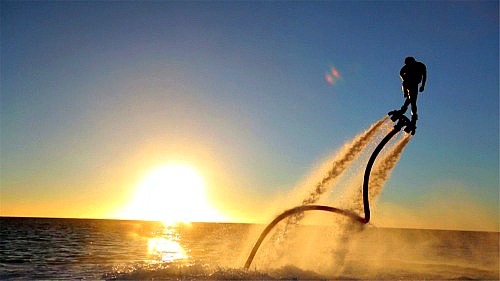 • Flyboards - a personal watercraft (PWC) accessory that uses the PWC’s thrust to propel the rider up to 45 feet in the air or allow him to dive below the water like a porpoise. 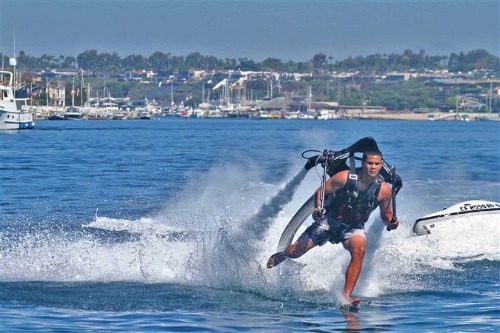 · Jetlev - Looking like something out of a Buck Rogers or Flash Gordon comic strip, this Sci-Fi-like water-propelled apparatus can propel a rider, safely secured to an ultralight backpack, up to 30 feet above or below the water. Jetovator Just Cruising - Photo: Courtesy Jetavation Inc.
• Jetovators - Sleek and Futuristic, the Jetovator looks like something out of a SciFi movie. 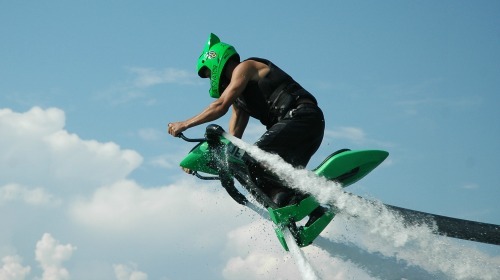 This water-propelled flying stunt bike has been described as a cross between a dirt bike and a stunt plane. 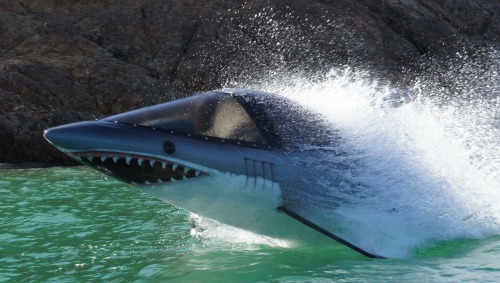 • Seabreacher - Like something from Jules Verne in 20,000 Leagues Under the Sea, it is a fanciful blend of a marine mammal and a high performance fighter jet. The pressure is on, snow enthusiasts! You need to put on the old thinking hat and dream up something wild and ridiculous. Otherwise you’ll be left behind. I am sure I have not covered all the Lake Powell water activities. If there are any you would like for me to write about, please use the invitation below. I will try to respond as quickly as possible.